Anne Marie Swanson works exclusively to draw individuals from underrepresented groups into STEM fields. As CGI’s U.S. education and workforce development coordinator, Swanson is responsible for the STEM@CGI program, which introduces, inspires and mentors students who are part of groups underrepresented in the technology industry to STEM fields. The program focuses primarily on girls, minorities and the economically disadvantaged. “One of my biggest strengths is connecting needs with resources. 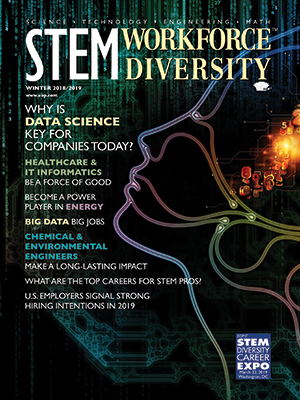 In STEM fields - especially computer science - women, minorities and those from economically disadvantaged backgrounds are woefully underrepresented. Technology careers often come with good salaries, flexibility and job satisfaction. There’s also a talent shortage in STEM - and again - especially in computer science,” says Swanson. The flagship program is CGI STEM Camp, a half-day camp taught by CGI members who expose students to STEM in fun and engaging ways. To date, hundreds of CGI members have reached more than 3,000 students in 10 locations nationwide via 45 STEM@CGI events. “The intention of these programs is to both close the STEM gap and diversify our industry,” notes Swanson. CGI has been a leading partner to the U.S. federal government for more than 30 years offering solutions support of its mission-essential needs at every stage of program, product and business life cycle. Its global headquarters is in Montreal, Quebec, Canada, with offices all over the U.S. and throughout the world. Demonstrating how Swanson’s work overlaps with GGI’s mission, she recently gave a presentation on the power of public-private partnerships at the National Council for Community and Educational Partnerships annual conference in Washington, DC alongside a representative from the Lafayette Parish School System’s GEAR UP, CGI’s first STEM program community partner. GEAR UP is a federal grant program that helps prepare low-income students for college. CGI and GEAR UP have co-presented STEM Camps, mentored students in the Congressional App Challenge - including the winning team from Louisiana’s 3rd Congressional District - and co-presented T.3, an event where local teens taught technology to adults. “During our presentation, we shared the value of business, government, education and non-profits working together, along with a formula outlining the best practices on maximizing these partnerships,” she adds. Swanson was the fourth employee hired when CGI started its new Lafayette, LA office in 2014. What she enjoys most about her job is the opportunity to help make a difference on issues both important to the industry and to society in general. She also appreciates that CGI allows employees the ability to drive their own careers. “CGI’s culture fosters innovation,” says Swanson. To be successful Swanson advises others to focus on what they’re good at, not what they struggle with. “Find what you’re good at, focus on that, and figure out how to manage or delegate the rest,” she recommends. Find available career opportunities with CGI at cgi.com/en/careers, and connect with the company on Facebook, Twitter, Google+, LinkedIn and YouTube.